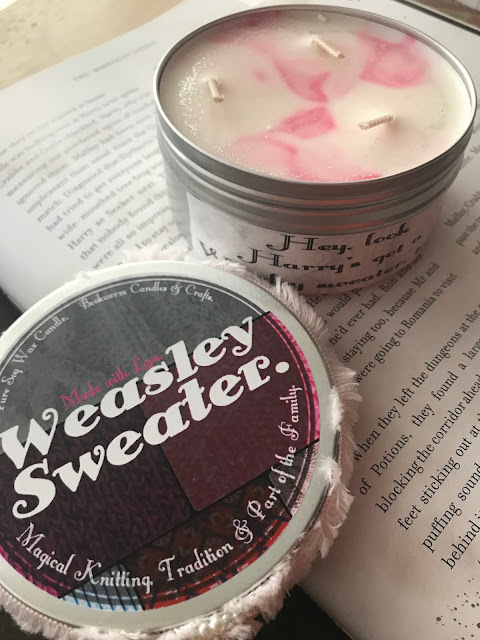 I'm a HUGE fan of Bookworm Candles & Crafts & have bought loads of Danielle's candles so I was really excited to get the chance to spotlight her December Weasley Sweater candle for you today. I also have a fantastic discount code for you that'll give you 20% off the ENTIRE Bookworm Candles range so make sure you stick around to the end of the post! 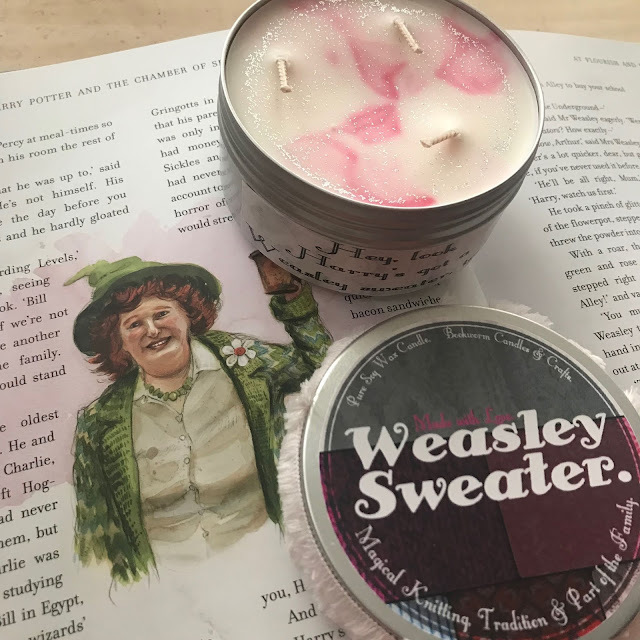 The Weasley Sweater candle is inspired by the annual sweaters that Mrs Weasley, everyone's favourite fictional mum, makes as Christmas gifts for all of her children and even for Harry when she realises he doesn't have his own family looking out for him. 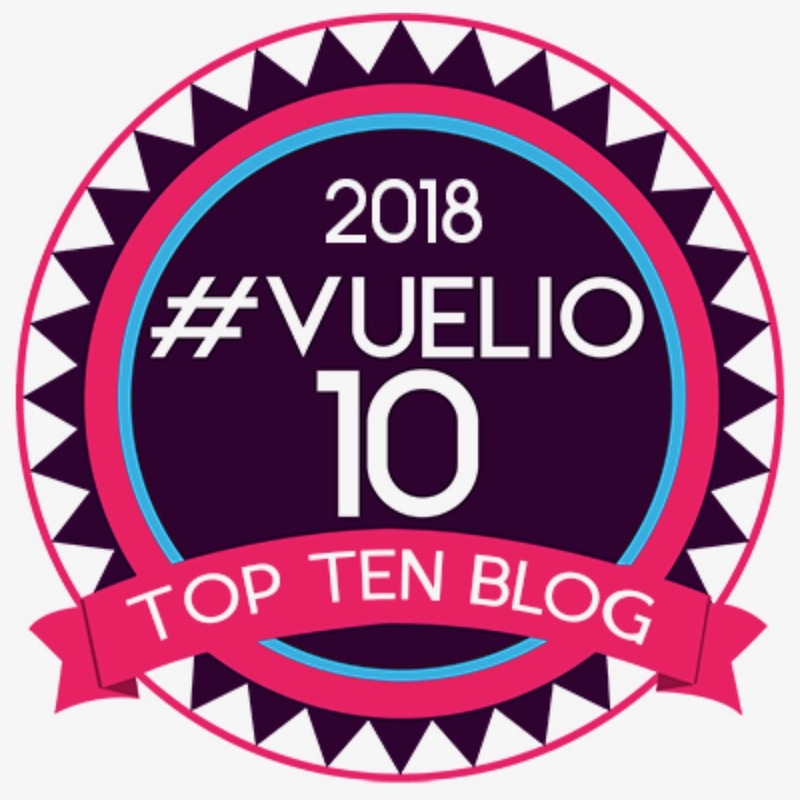 I love the way the Weasleys are so willing to welcome others to their family, they may not have much but they have plenty of love which is far more important than money. The candle comes in a great sized 8oz tin and has 3 wicks to make sure it melts evenly. It has a beautiful cream and pink marble effect with pretty sparkling silver glitter sprinkled on top and it smells gorgeous. The scent is inspired by Magical Knitting, Tradition & Part of the Family which also translates into juniper berries, pine and warm cotton - an absolutely perfect winter smell for this time of year! 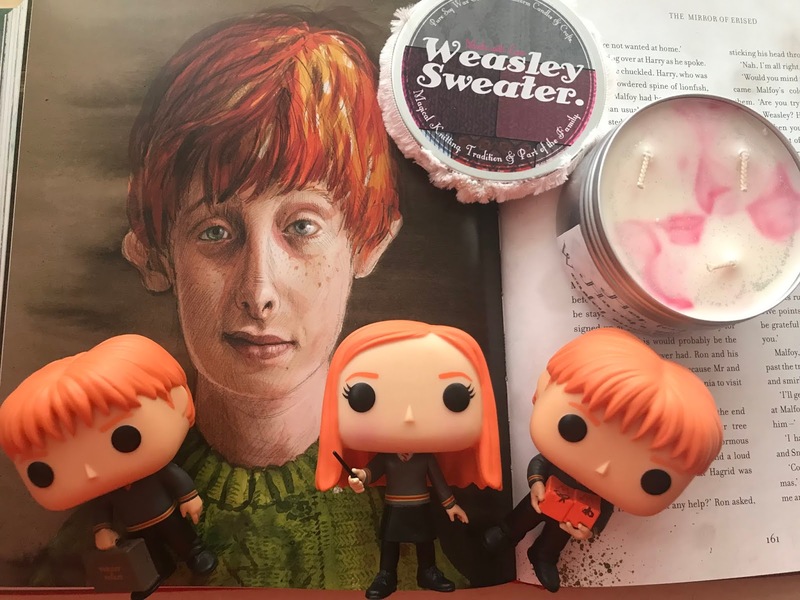 The Weasley Sweater Candle will only be available for the month of December so if you want to get your hands on one you should buy it quickly before it sells out. It's a bargain price of only £5 and don't forget you can get a 20% discount from this candle - and ANYTHING else you add to your order! 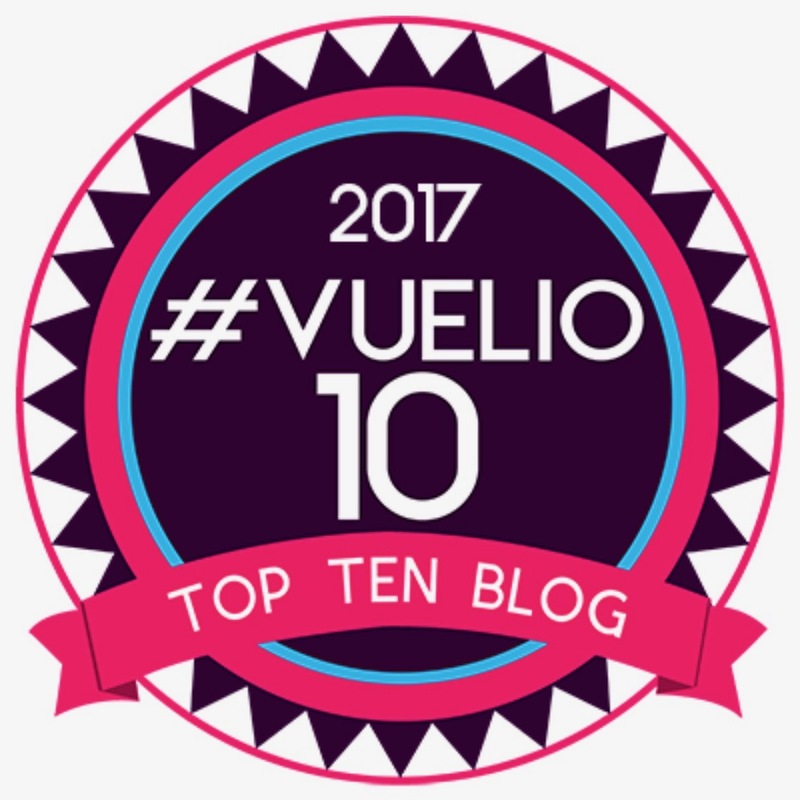 - by using the code BLOGGERS20! You can purchase candles directly from the Bookworm Candles website and follow them on any of the sites below for more information. 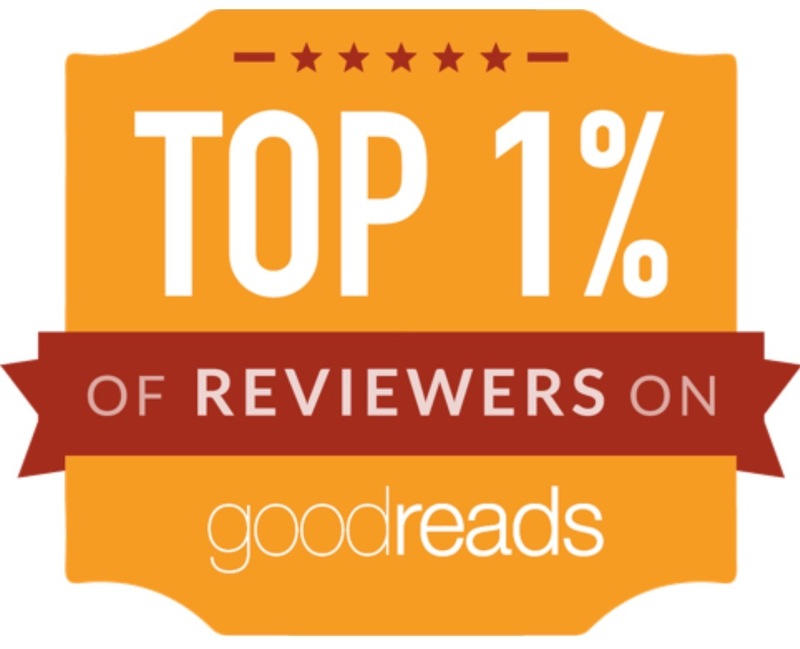 Please note I received a free Weasley Sweater candle for the purpose of writing this review but that has not influenced my opinions and I've made purchases from Bookworm Candles in the past with my own money. 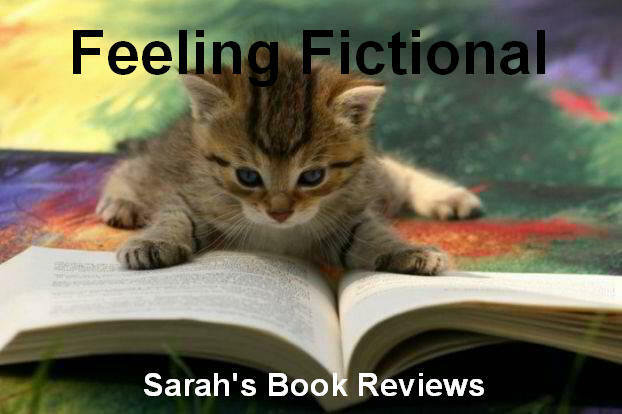 I received no other payment for this post.